yeller77 had the most liked content! You'll get a similar experience with any event, would simply decide what time of year you want to be there and what else you want to take in on the trip. Not much else to do around there except gamble in beautiful Wendover. Any mountain activities (Park City, etc) would be good in August. Sept and Oct being tween season and hit or miss on weather. Just don't forget to slather sunscreen under your chin as well as everywhere else. Especially enjoyed how the longest string of comments degenerated into an argument about what a load of s*** Twitter is. " 'Tis!" " 'Tisn't!" Time to be Debbie Downer. Everything at this point is pure speculation. This is what Polestar was: This is what Polestar now is, under Geely, a Tesla competitor: No one knows what Lotus will be under Geely but Geely. They will decide what segment they wish to compete in. Lotus has always been a manufacturer of accessible road and track cars that punch above their weight (pun intended). 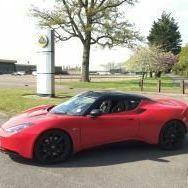 While I've always been a fan of Lotus' growth, with what is being leaked, they could very well be made of unobtanium in the future and lack any trickle down effect to the current fan base or heritage. The Automotive News Europe article got one thing right, that the talk of the stratospheric market segment and $1 mill Lotus sounds a bit "Baharish." The longer they are taking to define themselves, the more glass half-empty I become. One can only hope. UMC is a large venue already pretty well occupied with Ford's Performance driving schools for the Raptor truck, GT350, and Focus RS but with multiple track layouts I'm sure there'd be room for more. I was fortunate to spend time there for the RS Adrenaline Academy. It was a blast and the complex is huge. THE Dino! Good on the shorts...adding lightness. Keep the great reading coming, Scott! This kind of thing doesn't tend to come out of the blue. Perhaps JMG being a money man was brought in to to weather the storm and right the ship. (that's it for my nautical references) His success at Lotus is good on his resume'. Barely related Lotus content: famously crashed a Citroen SM in the opening scenes of The Longest Yard. Very prolific actor. RIP, Bandit. A little Mopar to go with the Mach1? 440 six pack? Go big block or go home! Good luck squeezing that down the country lanes. Enjoy the new ride. Hope you can find some wide open spaces to enjoy it and a DJ to cheer you on! The Lotus community have always had a love/hate relationship with Claudius. Certainly back in the day there was a demand for his conversion products as many wanted to update the early cars to S2 or Turbo look. That era has clearly passed, got to respect the quality of his fabricating ability, though. But, that badge? Why, Claudius, why? Thanks, Paul! I notice that SJ are advertising a "marcasite" replacement material. Wonder if anyone has seen what they sell and can comment. Just looks like a brown ultrasuede from the pics. You have discovered the next holy grail of restoring a marcasite interior (in addition to replacement marcasite). The pleats were created with a novel technique with patents in the early '70s: ultrasonic fabric welding. This has become commonplace in garment manufacturing but has proved inaccessible for upholstery fabric pleating. Commercially available vinyl pleated upholstery typically does have heat-welded pleats. As for fabric, most are left with sewn pleats at this point. Also, if you find a good match for the mouse fur upholstery, I'd be interested in that info as well. Good luck. What made your blood boil today? Two keys to still having a few quid when called to the hereafter!